Next year, Comet ISON will pass very closely by the sun and may give us an amazing show. ISON stands for International Scientific Optical Network. Usually, comets are named after their discoverers, but it was a pair of astronomers in Russia with a telescope that’s part of ISON. This comet may turn out to be so bright when it approaches the sun that it’ll be visible in the northern hemisphere as the sun is going down. I’m hoping for a long tail that’ll be visible for some time after sunset. There are plenty of articles, but this one shows a photo of Comet Lovejoy in 2011. Will we see something like this? I’ve seen a couple of comets before. The first was Hyakutake in March 1996. I remember my sister and I going back to Edmonton after visiting our parents when I was in my first year of university, and I could actually see Hyakutake from the car. But even better was Comet Hale-Bopp in 1997. I had moved to Victoria to continue studying in university for my physics and astronomy degree, and during an astronomy lab session, we went to the roof of the building to see Hale-Bopp. It was still somewhat light out, but the comet was incredibly clear. Next year, we could see yet another bright comet. I really hope ISON will give us an incredible display. It’s expected to be bright starting in November 2013. Will you be watching? Have you seen any amazing celestial events? Let me know by leaving a comment below. I’m not likely to do another poll for quite a while. However, it’s possible I may choose my own book after this. I’ve enjoyed the polls, and it’s given me a bit of an excitement about the unknown. In the meantime, I’m also reading two other books, a non-fiction book that I read at night at home, and an eBook that I read on the train when I can’t sit down. I’d like to read at a faster pace. That is, I need more time to read. I’ll have to consider cutting down on some games and Youtube. As always, comments are very welcome! I’ve finally done it. I made an official blog for my future books and short stories. There isn’t much there yet, but you can check out what I have planned. In the future, I will have an in depth guide to my science fiction world, which has yet to be officially named. It will contain maps, country profiles, world history, important events, and notable people. It will also likely include information about native animals and plants. Please take a look, and if you have any comments or questions, please leave them here. As the title suggests, this post is about many things. I have a few things going around in my head right now, and I may as well get them all out in one post. First of all, I’ve been doing some outlining work on my upcoming short story, and I finally have a main character name. In fact, I’ve thought of names for most of the main characters. I while back, I posted about how difficult it is to choose names. For my main character, I already had a last name. It was the first name that I had difficulty with. But after a bit of research through name databases and checking with name meanings, I came up with a good one that’s appropriate for the character. However, coming up with a title is even more difficult. In fact, I’ve been having trouble with coming up with a name for the world. I have an idea, but I’ll have it figured out soon, I hope. The title, as well. Earlier this summer, I posted about a writing challenge, to write scenes for various landmarks around the world. I haven’t started yet, but I do plan to do this. It may give me some inspiration. Finally, websites. This is a big thing. I’m going to begin developing a homepage for myself, also with WordPress. It’ll be my official author page, and won’t be updated like a blog. However, it’ll have links to my various blogs, so anyone can see what I’m up to. On that website, I will post updates on my writing process, as well as develop a kind of reference guide for the world I’ve created. This blog will continue as always. 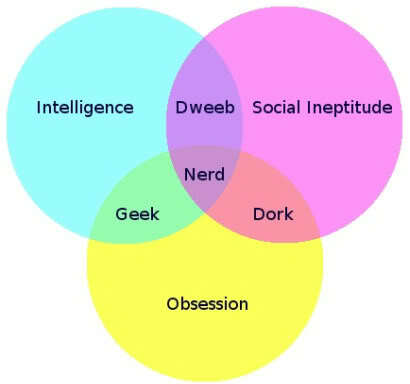 Intelligence, social ineptitude, and obsession are the prerequisites for a nerd. Until university, I was a nerd. I did very well in school, I was quite shy, and I was a big Star Trek fan. Now, I’m not socially inept, as I teach for a living, and have had a decent social life. That leaves me with geek. I am a geek! And I’m proud of it! Nerds and geeks are very important people in the world, especially in the fields of science and engineering. Many of the electronics and devices that you use everyday were developed by intelligent people who were most likely obsessed with the very things that they worked on. You know Arthur C. Clarke, the author of 2001? Not only was he a science fiction author, but he was also the inventor of the communications satellite. Not bad! I mentioned that I was obsessed with Star Trek. I still am, though not as much as I used to be. I’ve branched out a bit. However, I do have a goal of owning every episode and movie on DVD or Blu-ray, as well as wanting to read many of the novels. But that’s not my only obsession. I’m also obsessed about fantasy novels. It’s my favourite genre at the moment. I also love science fiction, which was my first literary love. I’m even writing science fiction. Back in my childhood, I was obsessed with knowledge in general. I enjoyed reading encyclopedias, and I couldn’t get enough of dinosaurs and astronomy. Soon after, my obsession with Star Trek started. Around the mid-80s, I played around with BASIC programming on my Apple IIe computer, which resulted in my obsession with computers. I breezed through my computer classes in junior high school and high school, as I’d already known all about the topics we studied. For a while, I was very interested in cars, and much to the surprise of my classmates in high school, I even took an automotives class. The auto class was basically a kind of applied science, or engineering. It really shouldn’t be surprising that I was interested in it. But these days, my obsessions include more than just the classic geeky things. I also really enjoy nature, history, and architecture. I like to take pictures of buildings, old and new. Living in Japan makes this easy for me, as Japan has some amazing modern buildings, as well as a huge number of historical sites. I love walking long distance, though I haven’t had a chance to do much of that recently. I walked 35 km in one day two years ago. I discovered Instagram last year, and have taken more than 500 pictures with it. On the more brainy side of things, I love maps and geography. I can picture them in my mind quite easily, and I usually know exactly where I am and how to get somewhere. I also love statistics. I’m always watching how many views my blogs get, where the people live, which pages are popular, and so on. I read all about sports stats, especially for hockey and sumo. How’s that for an odd pairing? Population of countries and cities is a very interesting topic for me, as well. I’ve used both geography and statistics to develop the world I’m basing my writing on. Obsessions can be very useful! I’m very happy to be a geek. Life is more interesting this way. There’s something interesting everywhere I look. I’ve been a Star Trek fan since the 1980s when The Next Generation was on TV. I have watched every Star Trek series and movie (although I did miss some of the last couple seasons of DS9, which I have on DVD). However, I have never read a Star Trek novel. I often wonder how good they are. I prefer to read books that don’t tamper with canon. But I’ve read that the first TNG novel was written before the first episode even showed on TV, and that the author was given a description of the characters to base her book on. Not exactly giving me much confidence in that book. But I’m very curious about Star Trek novels. Eventually, I’d like to read a large number of them. So, my question to you is: Do you have any suggestions about which Star Trek novels would be the best place to start? And just a reminder to answer my other book question. Please vote on my sequel poll! My world has been in development for years, yet I haven’t completed any stories for it. Well, now is the time to change it all. I am ready. I have a story, I have the characters, and it’s all been in my head for 12 years. And what will it be? A short story. While writing a novel is my goal, I think it’s best to start small. I plan to write a series of short stories based in my created world, and the first one I am writing will set up the entire premise of the my universe. It will give a beginning to the story, and it doesn’t require a novel. It will be a short story, or possibly a novella. I will introduce you to my world and the characters that live in it. It hasn’t had an official name, but I have one in mind. You see, this world is a planet orbiting a real star, one that is similar to our sun and has been a target for a search for exoplanets. None have been discovered so far, but that doesn’t stop me from writing science fiction about it. That’s what’s wonderful about speculative fiction. I’m getting my creative juices going now. I’ll be writing whenever I can. I hope you’ll enjoy the final product!